LOCATION.--Lat 40`36'40", long 76`54'44", Northumberland County, Hydrologic Unit 02050301, on right bank at bridge on SR 3017, 2.0 mi upstream from mouth, and 3.2 mi south of Dalmatia. PERIOD OF RECORD.--October 1929 to current year. Prior to October 1945, published as Mahantango Creek East near Dalmatia. GAGE.--Water-stage recorder. 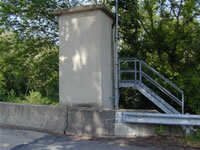 Datum of gage is 401.22 ft above National Geodetic Vertical Datum of 1929. Oct. 1, 1929, to Feb. 11, 1930, non-recording gage, and Feb. 12, 1930, to Nov. 18, 1973, water-stage recorder at present site at datum 0.72 ft lower. Nov. 19, 1973, to June 18, 1974, non-recording gage at site 2 mi upstream at different datum. COOPERATION.--Station established and maintained by the U.S. Geological Survey. Funding for the operation of this station is provided by the Pennsylvania Department of Environmental Protection and the U.S. Geological Survey.